I stumbled across this book last week and I knew I had to order it. I received it on Saturday and had a little free time on Sunday to make the dog for my son. The dog is made from a pair of my socks that have not been worn in a couple of years. Then I threw together the cat for my daughter. I used one of her old socks that was alone in her drawer. Who knows what happened to the other one? I had cute little white buttons picked out for the eyes, but Harper insisted on the maroon ones. All of the patterns use a pair of gloves or socks, but it is easy to mix and match lone socks or gloves to make any of these adorable creatures. I was a little afraid that the toddler sock would be too small, but I think it worked out perfectly. They stretch like crazy. What a great way to use outgrown socks and make a little keepsake or gift. Speaking of gifts, I made this hat to match these booties last week. Now I just need to mail it to the little girl before winter is over. I have several little projects in the works in hopes of opening up an Etsy store in time for Christmas shopping. So hopefully more on that next week. Has anyone else been doing anything crafty? Those are adorable! I need to get my crafty-groove on and try something new. It's been too long since I've made something. Your so TALENTED! I love both the adorable animals and the hat is precious. Oh I LOVE that hat!!! Congrats on opening up a store! 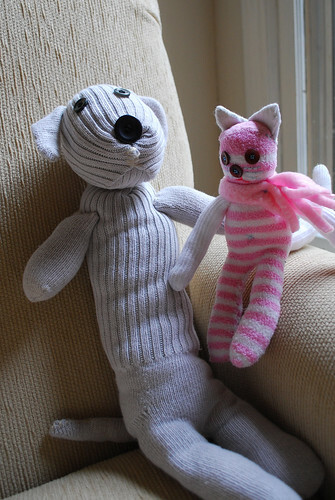 Cute cute sock and glove animals. :) What a great book. Good for you for opening up an Etsy store. You do so well at making all of these little animals. 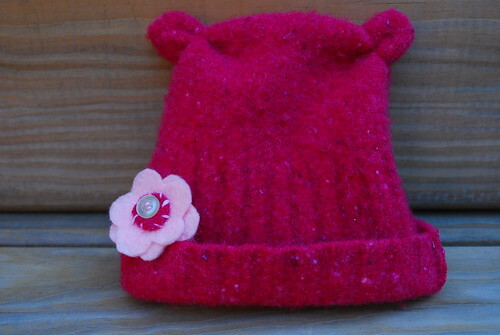 And the hat is so cute too with the little ears! Yaaa! I've been doing a lot of thinking about being crafty. No seriously, A LOT of thinking! What a great idea, now I know what we can do with all the lone sock that I just can't seem to throw away.